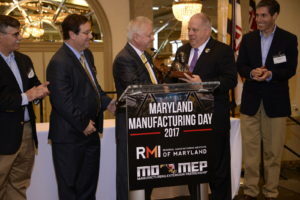 On October 6, Governor Hogan joined the Regional Manufacturing Institute and the Maryland MEP on National Manufacturing Day for a special Maryland celebration to raise the profile of Maryland manufacturing at Martin’s West. 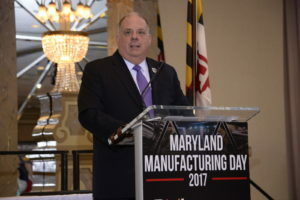 “This day presents a unique opportunity to connect the talented students coming out of Maryland’s leading universities and colleges with advanced manufacturers in our state,” said Governor Hogan. “We are excited about the manufacturing resurgence we are seeing here in Maryland, and we are proud of the innovation and creativity at work every single day among manufacturers in our great state!” The Governor toured the trade exhibits that were set up to showcase Maryland’s advanced technology expertise and the talented STEM-related clubs, programs and competitive teams coming out of Maryland’s colleges and universities. Manufacturers displayed a diverse array of technologies and products including aerial reconnaissance drones, robotics, augmented reality, tool works, consumer products, high-end batteries, electronics and more. Exhibiting advanced manufacturers included: Arnold Packaging, ATP-MD, LLC; BD Life Sciences – Diagnostic Systems; Control Cable; COTY; Direct Dimensions, Inc.; FLAVORx; Harbor Designs & Manufacturing; Holmatro, Inc.; Independent Can Company; Knorr Brake Company; Lion Brothers Co.; Maritime Applied Physics Corporation; North American Millwright Inc; Orlando Products Inc; PRS Guitars; Ready Robotics; SAFT America, Inc.; Semforex; Stanley Black & Decker; Textron Systems; Thornaby Quantum Electronics, Xometry and Zentech. 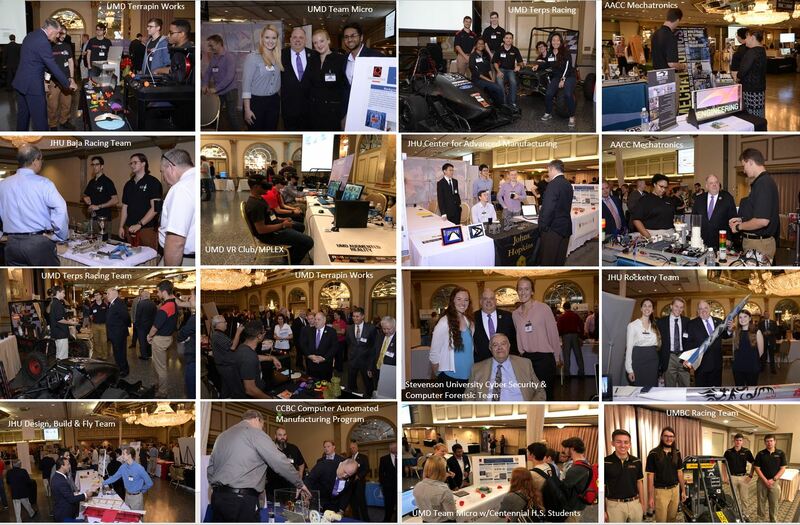 The student exhibitions highlighted many synchronistic applications for manufacturing, showcasing rockets, 3D printing, virtual/augmented reality games, biomedical applications, electric cars and more from Ann Arundel Community College, Baltimore County Community College, University of Maryland; Johns Hopkins University; Capital Technology University; Towson University and Stevenson University. The event was organized to build relationships between the manufacturers and the students and many manufacturers were eager to assess the talent. The number one problem facing manufacturers nationwide is a skills shortage for today’s advanced manufacturing requirements. “students had an opportunity of a lifetime and were beaming at the end of the day” said Peggy Walton, Instructional Specialist, Electronics Engineering Technology, Mechatronics Engineering Technology at Anne Arundel Community College.”Many of them received resume requests, which we just happened to have on hand, and AACC was able to connect with many on the industrial side” she said. 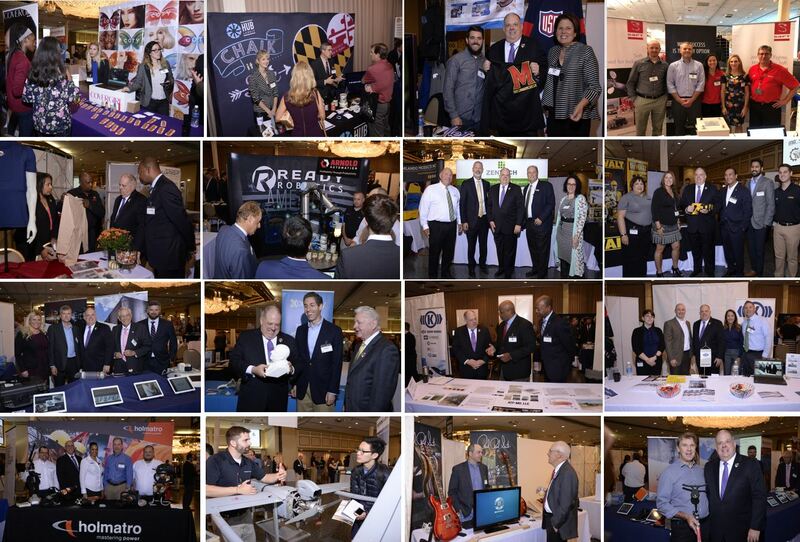 “By every measure, the RMI/MEP Maryland Manufacturing Day event was successful in engaging university and college students with manufacturers, showcasing advanced technologies and bringing people together” said Mike Galiazzo, President of RMI. Governor Hogan visited almost every student and manufacturing exhibit, learning about the “technological face” of Maryland’s next generation manufacturing and Maryland’s future workforce. “This event drew almost 400 attendees and was one of the nation’s largest events of its type in the country,” said Galiazzo.